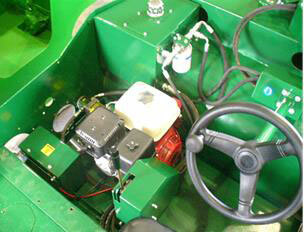 an easy to install, easy to operate, hydraulic drive unit. The engine and gearbox fitted to the AR3/4 are fine when working correctly, however the majority of Auto-Rollers are elderly and very expensive to replace with similar components. Even then, still not user friendly compared to new machinery. The bolt in upgrade kit from Poweroll consists of a new engine and hydraulic drive kit enabling a new lease of life for the old roller. This power pack enables your machine to start easily with a turn of the key, and is much more user friendly for the operator, even more so for the AR4 when the optional upgrade for power steering is selected. An AR4 Auto-Roller in our workshop in the process of being rebuilt with a new engine/transmission kit. This one is being fitted with a Honda petrol engine and power steering. This particular AR4 Auto-Roller has already been through our workshop. Completely dismantled, shot blast to bare metal and re-sprayed using the same 2 pack high quality paint applied to all new Poweroll roller. Most Auto-Roller parts are available from our extensive stock of traded-in Auto-rollers.